Visions of Rock opens Sunday, September 9, 2007 at 401 Projects gallery in New York City. Visions Of Rock features photographs by Bryan Adams, Melissa Auf Der Mar, Jakob Dylan, Perry Farrell, Mick Fleetwood, Lenny Kravitz, John Mayer, Graham Nash, Lou Reed, Patti Smith, Michael Stipe, and Andy Summers. The exhibition is sponsored by American PHOTO and Nikon and is curated by photographer Mark Seliger. The exhibition runs through November 4, 2007. 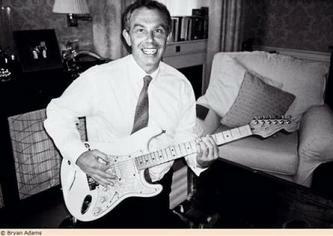 The image posted here is of Tony Blair by Bryan Adams. Visit the Pop Life Art homepage for links to artwork and photographs by more than 100 singers, musicians, and actors.